A woman has been arrested on suspicion of attempted murder after a man was injured with what police believe may have been a firearm. 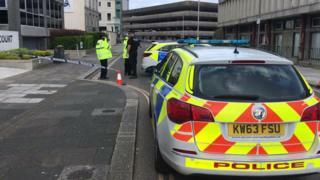 Officers were called to Princess Street in Plymouth, Devon, at 02:30 BST on Saturday where they found a 27-year-old man with an arm injury. The victim, from Plymouth, is known to the woman, who is also from the city. The woman, 27, remains in custody and the man's injury is not thought to be life-threatening, police said. Det Insp Dave Eames said: "It is believed that the incident involved people who know one another and appears to be isolated. "Further individuals are sought in connection to this matter and our work continues to locate and apprehend those that were involved in such a rare event for the city of Plymouth."